The Engineered Bicycles Gezel is a new disc brake-equipped steel road bike that's equally at home getting in the training miles, taking on a hilly sportive, or even tackling the local gravel roads. Engineered describe it as "the ultimate all-weather mile eater", so is it? Here are five things you need to know about the bike to help you decide. Just a quick word on pricing before we start. 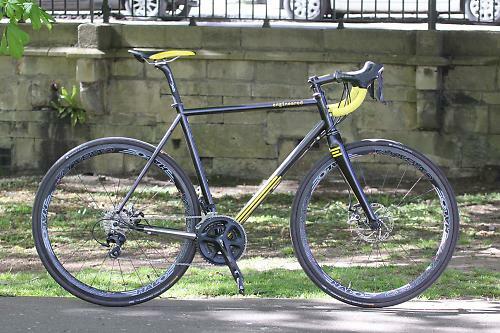 The price of the Gezel as built up here is £3,110, but it would be £2,670 for the same build with Mavic Aksium One Disc wheels. 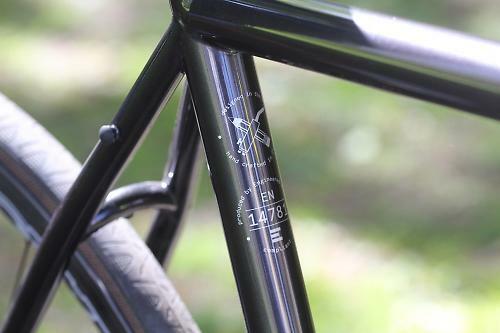 The standard frame and fork is £1,600. At the time of writing, Engineered Bicycles are about to offer Gezel full builds with a free Shimano 105 or Campagnolo Veloce groupset for a limited period. The Gezel is built to a pretty aggressive geometry for a bike that's designed as an all-rounder, and that means you can swap from a race bike easily enough for logging the training miles. We have the 58cm model in for review, and it comes with a stack height (the vertical distance from the centre of the bottom bracket to the top of the head tube) of 590mm and a reach (the horizontal distance between those two points) of 389mm. 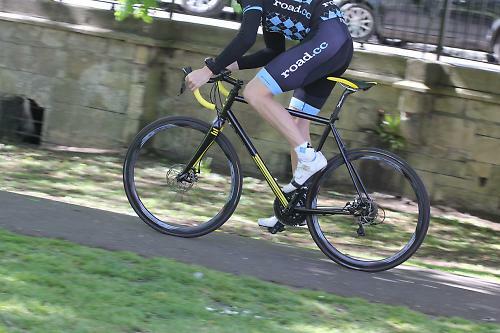 We published a First Ride on the Engineered Bicycles Donder criterium bike last year and the equivalent sized model has a 5mm shorter stack and a 12mm longer reach, giving a lower and more stretched riding position. The differences aren't huge, though, and you also need to bear in mind that the Gezel has a tall fork. The Gezel still feels like a performance-orientated setup if you whip out the headset spacers and position the stem low. Of course, you can leave them in place if you want a more relaxed riding position. The Gezel comes with stacks of tyre clearance and that also provides you with plenty of scope to alter the ride character. Our review bike came with 28mm Continental Grand Prix 4 Season tyres and you can run tyres up to 32mm for winter conditions, dodgy road surfaces, or if you just fancy a bit more comfort. I live close to a lot of gravel roads on Salisbury Plain (they're in the military area and they're open when the red flags aren't flying) and the Gezel is a whole lot of fun across these, the wider tyres providing enough shock absorption for comfort and control, and the riding position meaning that you're not compromising speed very much. You feel you can really put the hammer down on the better surfaced sections, while having the command you need when things get bumpy. The Gezel comes with eyelets for full-length mudguards. If you're likely to use the bike for getting in the winter training miles or year-round commuting they'll be invaluable. The maximum tyre width with mudguards fitted is 28mm. Rack mounts are an option at no extra cost. A rack might come in handy if you're going to ride the Gezel to and from work, and it would be pretty much essential if you use it for a bit of light touring, as Engineered Bicycles reckon you could. That's not something we've tried during testing because it's not the core purpose of this bike. 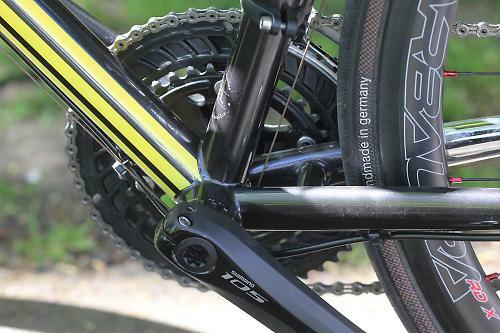 The Gezel's disc brakes further add to its versatility. 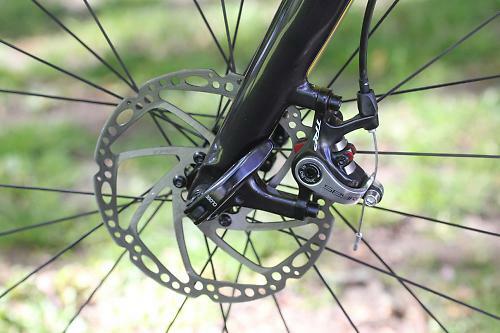 Our bike came with TRP Spyre mechanical brakes fitted, the best non-hydraulic road bike disc brakes we've used. I wouldn't say they offer a performance that's miles better than a very good rim brake on an aluminium rim in dry conditions, but they kick its arse in the wet. Plus, you can obviously use carbon rims without any drop off in braking performance. For year-round use in a variety of conditions, discs make a lot of sense. The Gezel is made in Italy from a Dedacciai Zero XL steel tubeset, and it is designed to be both strong and durable. Engineered Bicycles reckon that the tubes have the profiles and wall thicknesses necessary to give the frame stiffness and resilience. We can certainly vouch for the stiffness; there are no issues at all on that front. Like all other Engineered Bicycles frames, the Gezel has a 44mm diameter head tube and a press-fit headset for a tapered fork steerer. The upper bearing is 1 1/8in while the lower one is 1 1/2in. This makes for very good steering rigidity, the Gezel cornering accurately and predictably however hard you slam it into a turn. Engineered use press-fit headsets, the bearings located in pressed-in cups rather than drop-fitting directly into the frame. The fact that the bearing seat is a separate component (rather than part of the frame) is intended to safeguard the frame's longevity. If the bearing seat gets worn out or damaged, you can replace it easily. The Gezel also comes with a threaded bottom bracket as standard. Engineered reason that a bike that's going to see plenty of use in grimy conditions must be easy to maintain and a threaded BB fits that bill. No arguments from me about that. Oversized press-fit bottom brackets are great when they work properly but threaded BBs are often easier to live with and look after. That said, you can opt for a BB86 or PF30 bottom bracket standard at no extra cost, or go for BB386EVO for £30 extra. All Gezels are made to order so it's relatively straightforward to alter details like this. 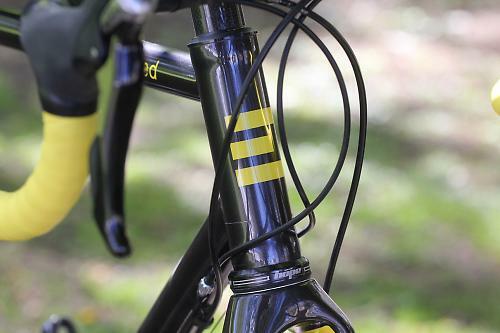 The gear cabling on our review bike is fully external, and that makes for easy maintenance too. Internal cabling looks cool and it can reduce drag a touch, if that's important to you, but replacing a cable can sometimes be a pain. Holes in the frame tubes for internal cabling also provide extra opportunities for water and gunk to get inside. Again, internal cabling for both mechanical and electronic groupsets are options if you'd prefer. The Gezel's geometry is based on that of a race bike but it's adapted slightly for a bit more long-ride comfort. It's not as flickable as the Donder, but it's still easy to manoeuvre and it performs a lot like a race bike in the way it reacts to your input. Our complete bike hit the scales at 9.21kg (20.3lb) so it's not ultra-lightweight, but I've taken the Gezel out on a lot of fast-paced group rides and it has got along well. Okay, it's not the kind of bike that flatters your climbing abilities, but it's more than capable on the hills, and it'll hold its own with anything on the descents thanks to the front end stiffness and the consistent performance of the disc brakes. 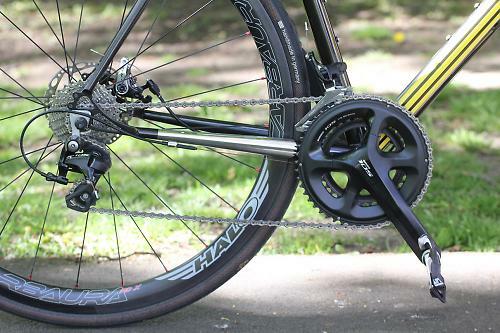 The Halo Carbaura RD X wheels on our review bike have proven themselves to be tough, handling all the gravel road abuse that's come their way without so much as a murmur, but they're not especially light. If you want to shed some weight and add a bit more zip to the ride, that would be the place to start (the Gezel comes in several standard builds but you can spec whatever you like if you speak to Engineered Bicycles). If this was my bike, I'd be inclined to have a set of wheels for normal road use, an overbuilt set with 32mm tyres for riding on the broken roads of Salisbury Plain, and a set for best. That's a lot of wheels and the cost would add up, but it would be a lot cheaper than having a bunch of different bikes. I'm not one of those people who'd have you believe that steel necessarily provides a comfortable ride, but I've been happy riding the Gezel for hours at the weekend. You have to be okay with the riding position (see above), of course, that's a given. Beyond that, wider tyres allow you to run lower pressures and that softens the ride. If you're after plushness, the 32mm tyres that you can fit feel incredibly forgiving if you're used to running 23s or even 25s. Plus, the Gezel comes with a 27.2mm diameter seatpost. Don't underestimate the difference a slim seatpost can make to the ride quality. All other things being equal, it'll deliver more flex than a chunky post and help to make the jaggedy bits feel less jaggedy (of course it's a word!). 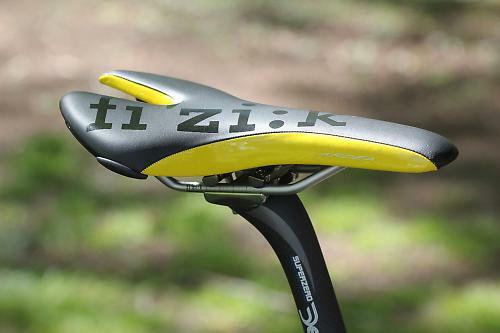 Our review bike came fitted a Fizik Ardea saddle that provides a decent amount of flex in its nylon carbon-reinforced shell and enough padding to soak up vibration without feeling too squishy. 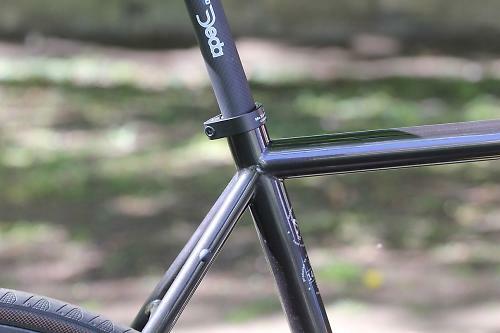 I've already mentioned that you can opt for a BB86, PF30 or BB386 bottom bracket if you'd prefer that to threaded, you can go for internal rather than external cable routing, and you can have rear rack mounts as a no-cost extra. 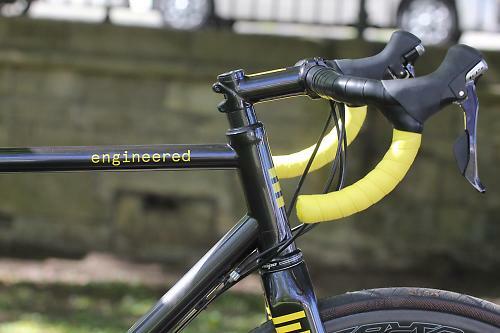 Engineered Bicycles offer a lot of other choices too. For a start, you can have your frame made from Columbus XCR stainless steel rather than Dedacciai Zero XL. 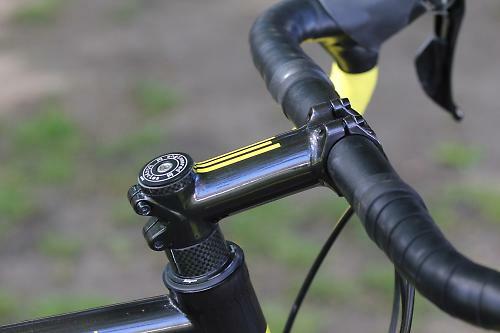 You can also go for an integrated seatpost. The Gezel we have for review comes with 135mm spacing between the rear dropouts and uses a standard quick release lever, but you can have interchangeable dropouts for a 135mm quick release or a 142 x 12mm thru-axle system if you prefer. That will cost you £30 extra. You can go for a thru-axle fork too, if you like. The thru-axle fork can have mudguard mounts. Engineered 3D print the mounting lugs and these are then professionally bonded to the fork. They say this has no effect on the base structure of the fork. Oh yes, and although this grey is the standard finish, you can choose another colour if you'd prefer, or even go for a bespoke colour scheme (prices will vary according to what you have done). On top of all that, you can have the Gezel in a made-to-measure geometry (from £50 extra, depending on complexity). If you're after a single bike that can handle year-round training miles, hilly sportives and even gravel roads, the Gezel could be a very good choice for you. Versatility is its biggest strength and that helps to justify the price. The standard frame and fork is £1,600 with delivery taking six to eight weeks (each one is built to order). Complete builds are available with prices starting at £2,600 for a Shimano 105-based spec and from £2,800 for Shimano Ultegra. However, Engineered Bicycles are just about to offer Gezel full builds with a free Shimano 105 or Campagnolo Veloce groupset for a limited period. 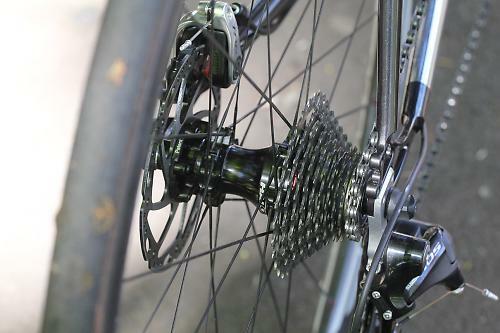 If you'd rather have a higher level groupset, you'll only be charged the cost of the upgrade from 105. This is a promotion that's running for a short time (otherwise it wouldn't be a promotion, it would just be the way it is) so you need to head over to http://engineeredbikes.com/ to get the details. The promo will begin in the week following the Bristol Grand Prix on 20 June 2015. That's an event that Engineered Bicycles is sponsoring. That promo price makes the Gezel look very attractive indeed. 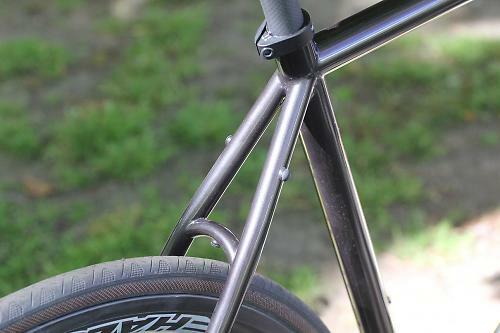 The frame is made from a custom Dedacciai Zero XL steel tubeset, although Columbus XCR Stainless is an option. Engineered Bicycles say, "The Gezel (old Dutch for journeyman or companion) is designed to be the ultimate all weather mile eater. The inspiration came from serious racers looking for a bike that could be ridden throughout the year but offering the fit and character of their race bikes. "Tested on the Flandrien cobbles, Gezel has the versatility and comfort to be more than capable across several disciplines and delivers the racy feel that is central to the Engineered DNA. 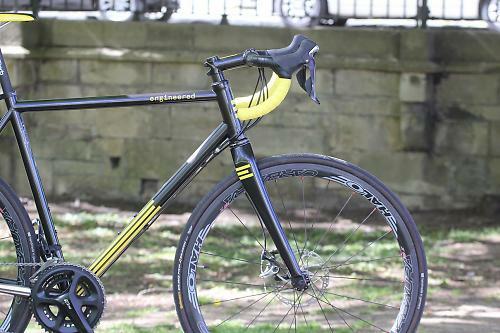 "Gezel could be called an 'adventure bike', but it is equally suitable as a Sunday Best machine capable of tackling any sportive you can throw at it from Etape to Roubaix." Engineered also describes the Gezel as a "premium steel disc brake road frameset designed for long days in the saddle, all year round". That's all pretty fair. I certainly agree that the Gezel is versatile. Although this grey is the standard finish, you can choose another colour if you'd prefer, or even go for a bespoke colour scheme (prices will vary according to what you have done). You have to be okay with the riding position (see above), that's a given. Wider tyres allow you to run lower pressures and that softens the ride. If you're after plushness, the 32mm tyres that you can fit feel incredibly forgiving if you're used to running 23s or even 25s. The Gezel comes with a 27.2mm diameter seatpost. Don't underestimate the difference a slim seatpost can make to the ride quality. All other things being equal, it'll deliver more flex than a chunky post and help to make the jaggedy bits feel less jaggedy (of course it's a word!). The Fizik Ardea saddle provides a decent amount of flex in its nylon carbon-reinforced shell and enough padding to soak up vibration without feeling too squishy. We can vouch for the stiffness. Like all other Engineered Bicycles frames, the Gezel has a 44mm diameter head tube and a press-fit headset for a tapered fork steerer. The upper bearing is 1 1/8in while the lower one is 1 1/2in. This makes for very good steering rigidity, the Gezel cornering accurately and predictably however hard you slam it into a turn. No issues at all on the stiffness front. A little but not a problem. It's nimble. The Gezel's geometry is based on that of a race bike but it's adapted slightly for a bit more long-ride comfort. It's not as flickable as the Donder, but it's still easy to manoeuvre and it performs a lot like a race bike in the way it reacts to your input. It's really tough to mark value here. You get the opportunity for lots of customisation (bottom bracket standard, internal or external cabling, component spec, and so on) so it seems unfair to compare this to an off-the-shelf bike. On the other hand, it wouldn't be right to compare the price to that of a full custom bike either because you'd need to pay extra if you wanted a made-to-measure Gezel. Considering the fact that each Gezel is made to order, the value looks very good. The performance looks better the more of the Gezel's varied skillset you're likely to make use of. 2. 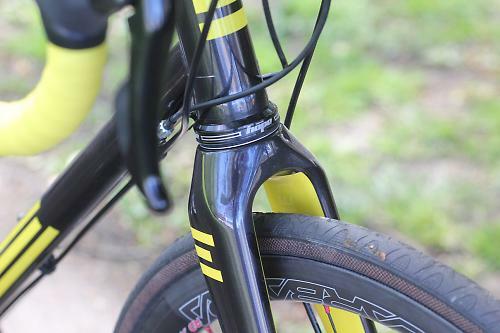 That fork looks like it can handle more than 28c tyres with mudguards. Why not raise the seatstay bridge a bit instead of making it the limiting factor? I don't see why that would hurt, and people wanting to run wider than 28c with their guards fitted could do that. Masterchief: Thanks for the kind comments! You are entirely spot on about the fork, it can take more than 32c. The seat stay bridge spacing has been set to give a sensible clearance in the configuration most bikes will be used in - i.e. with 28c tyres. If we made the standard clearance greater, the guards would either require spacers or would be compromised with 28c rubber. As they are, you can sneak a 32c in with full guards, but the clearance is a bit tighter than I'd be comfortable allowing for the inevitable detritus and wheels potentially being knocked out of true. However, as they are all built to order, it would certainly be possible to request rear seat- and chain stay bridges positioned for 32c + guards. This is exactly the type of bike I could be convinced to blow money on. But having had both in recently is it this or the Mason Resolution? Bespoke vs. mass produced. Any colour you like. Highly customisable. If you ask me, I'd say it is an easy decision. Of course, I am biased.